Robot DE NIRO. Credit: Robot Intelligence Lab, Imperial College London. In the future, robots could play a key role in healthcare settings, easing the lives of the elderly and assisting vulnerable individuals. 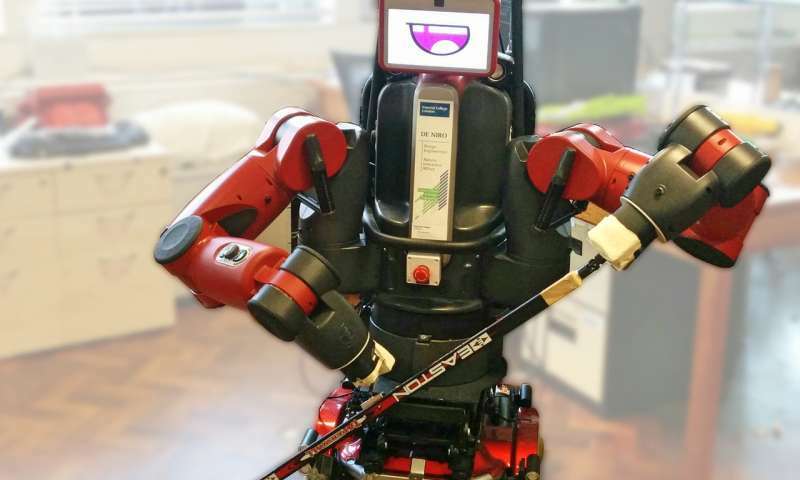 Researchers at Imperial College London have recently created Robot DE NIRO, a robotics research platform that could support caregivers, while also interacting directly with the care recipient. 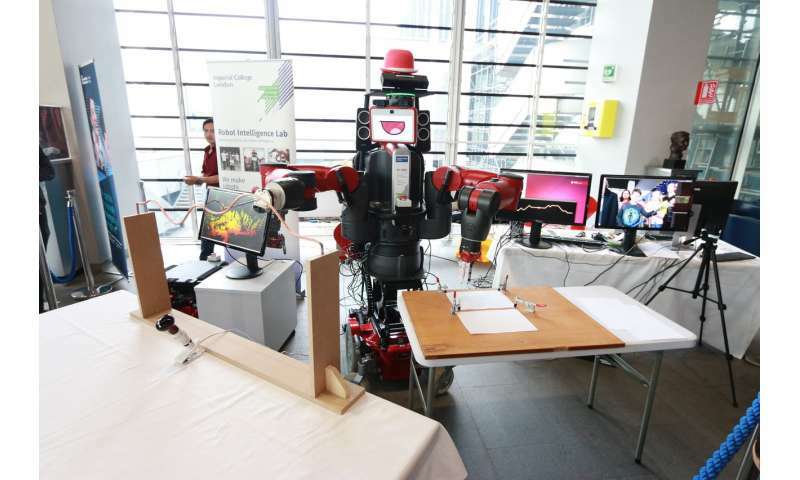 "The objectives of our project were surprisingly simple: to build something that could demonstrate social utility and contribute to Dr. Kormushev's Robot Intelligence Lab," Fabian Falck, one of the researchers who developed Robot DE NIRO told TechXplore. "We had a handful of grand ideas, but in the end, decided to teach a robot to play fetch. We considered object retrieval to be incredibly valuable and applicable to many situations, for instance fetching medicine for frail patients who struggle to move. Our project also equipped DE NIRO with capabilities such as navigation, face recognition and object manipulation." 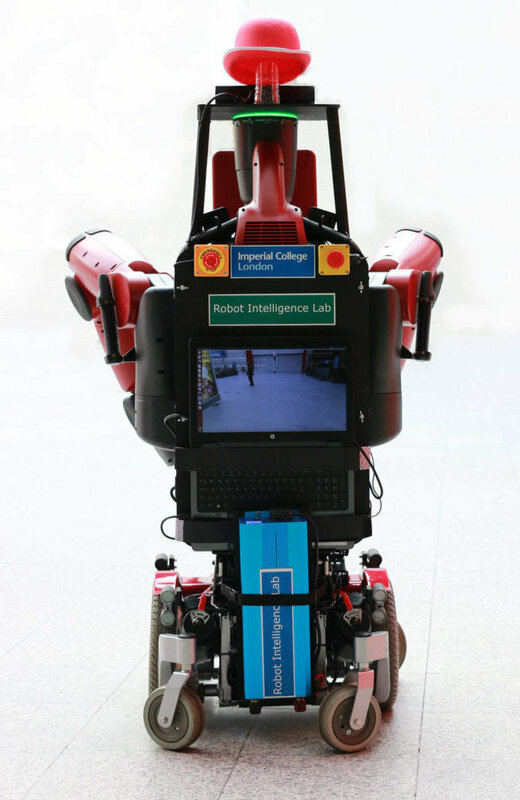 The robot developed by Falck and his colleagues can effectively tackle advanced and complex manipulation tasks. DE NIRO interacts with humans and reliably, while also autonomously moving around dynamically changing environments. 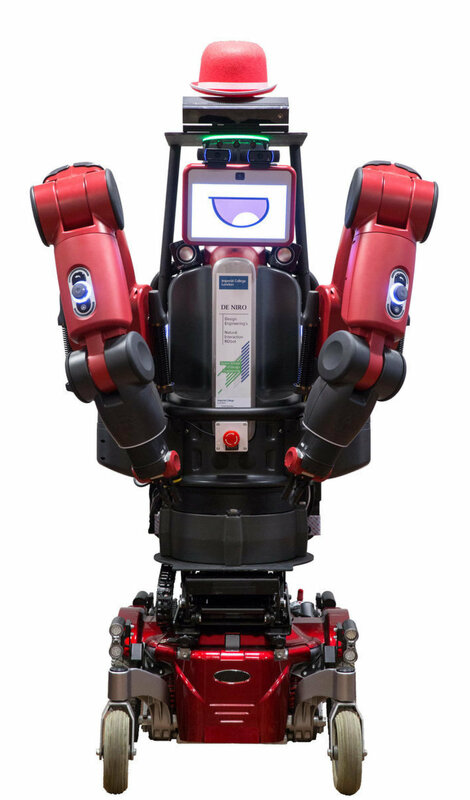 "Robot DE NIRO combines Rethink Robotics' Baxter robot with a wheeled mobile platform that makes it capable of moving around," Falck explained. "In addition, DE NIRO was enhanced by a variety of sensors such as a Microsoft Kinect and laser scanners that make it capable of perceiving its surroundings." 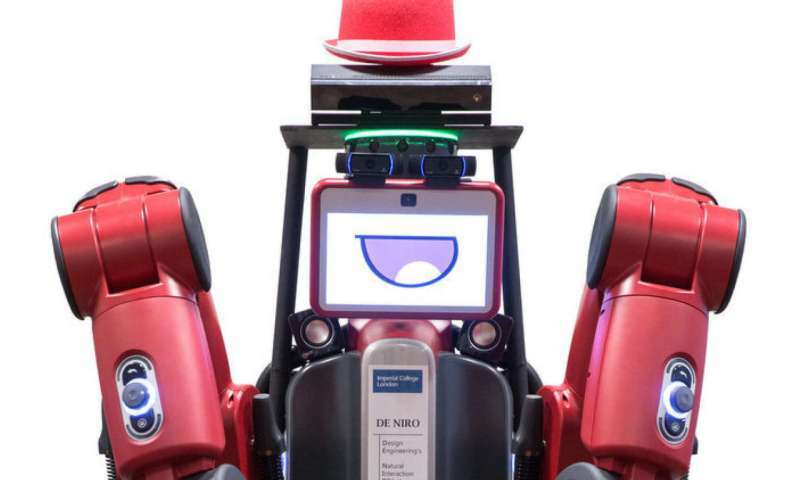 DE NIRO's safety features set it apart from many existing robots, ensuring that its interactions are human-centered and that the robot adequately responds to its users. As it was designed for use around vulnerable or elderly people, the researchers prioritized safety both in the robot's hardware and software. "Already in its hardware design, DE NIRO is built in a human-centered, collaborative way," Falck said. "For instance, passive compliance in the robot's arms absorbs physical impact with a person. When developing its software, we placed particular emphasis on collision avoidance during manipulation and navigation of the robot, so that it acts safely regardless of the action of the user. We believe that this will be a crucial characteristic of future social assistance robots." The research project carried out by Falck and his colleagues led to remarkable achievements. A primary accomplishment was the successful integration of various state-of-the-art machine learning (ML) and control algorithms into a single robot. 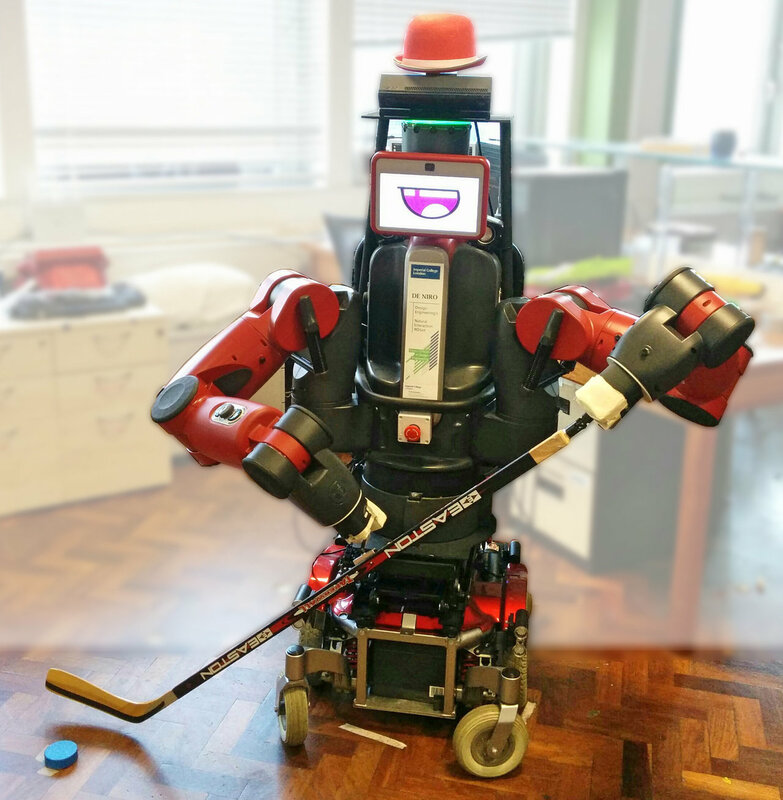 Robot DE NIRO playing ice hockey. Credit: Robot Intelligence Lab, Imperial College London. "We focused on the holistic design rather than perfecting a single task, with the hope that we can use this platform to explore further use cases in the future," Falck said. "Our project also demonstrated the significant value of open source software. The robot's software was grounded on ROS, open source robot operating system that comes with innumerable benefits, such as managing a variety of operations concurrently." 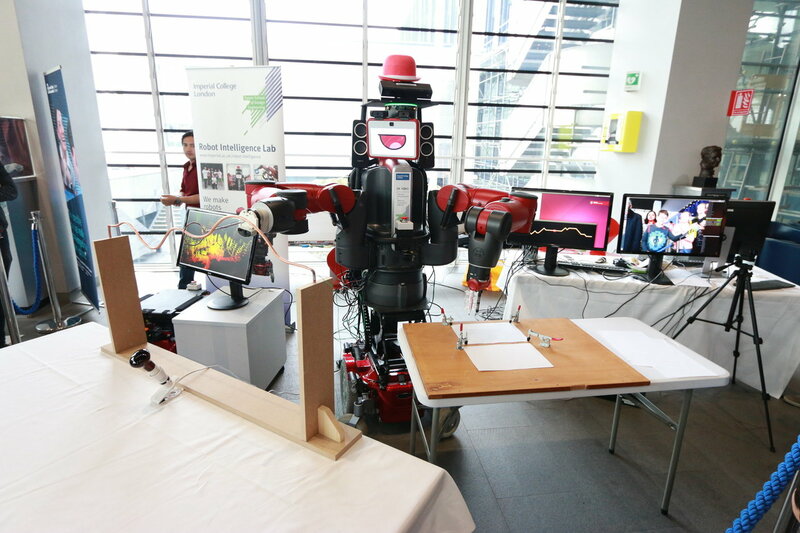 The final version of Robot DE NIRO incorporates ROS and a number of other open source projects. Using open source code, the researchers were able to build their robot in a relatively short period of time, taking full advantage of resources readily available online. "As the robotic open source community is still young, we were often left frustrated by the lack of online guidance," Falck explained. "Subsequently, we produced and published detailed documentation that should help others facing similar issues or looking to expand upon our work." 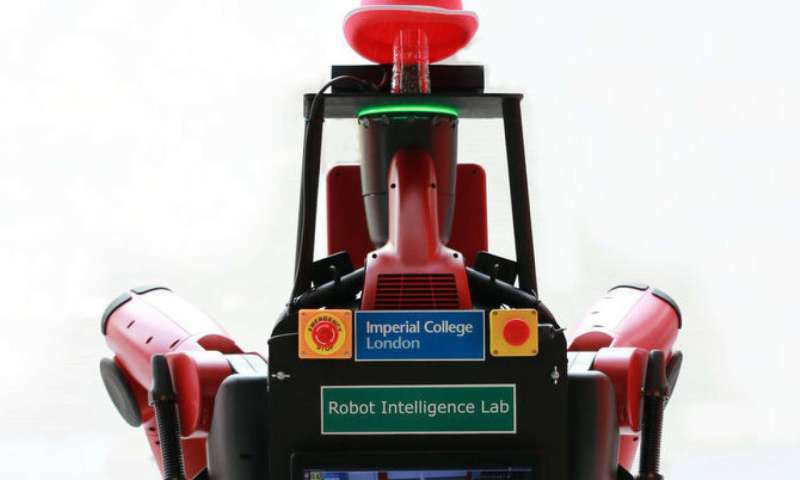 Robot DE NIRO at Imperial Fest 2018. Credit: Robot Intelligence Lab, Imperial College London. In preliminary tests and experiments, Robot DE NIRO performed remarkably well, showing great promise as a tool to assist caregivers and care-recipients in healthcare settings. Despite its dozens of sensors, however, DE NIRO is still very limited in its awareness of the world. The researchers will hence need to expand their research further before the robot is ready to enter real care environments. "We aim to implement further safety improvements by increasing DE NIRO's awareness, such as a 360-degree camera rig or the application of a 3D LIDAR," Falck said. "In addition, we will improve the point-cloud based manipulation techniques to allow a more generic grasping capability and enhance the currently rather rudimentary autonomous capabilities for navigation to act smoothly in unknown environments."